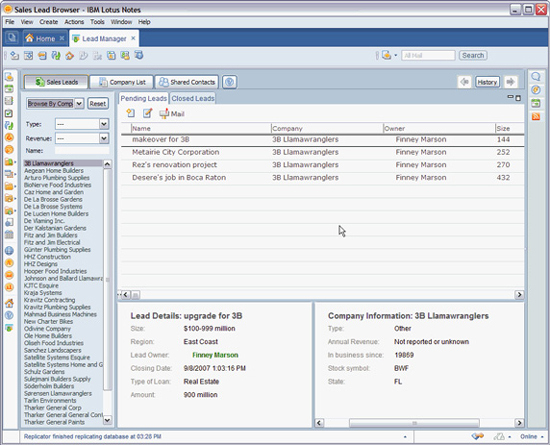 IBM™ gave Lotus Notes Client a general overhaul with version R8 and ported it to the Java based Lotus Expeditor platform. This is in turn based on the flexible Eclipse™ platform, familiar to many developers as a powerful framework for programming in Java. For customers, this new technical basis is an essential improvement of user interface and program functions, it provides clearly higher expandability through individual developments as well as benefits for software distribution in networks. The included productivity tools, an Open-Office-based office suite integrated in the client, also help save licensing costs. Composite applications are application components (e.g. selection lists, visualization elements like graphs or web forms) loosely grouped in a joint interface intended to support users in their work. The concept of loose coupling and the related lower mutual dependency of components make every element of the composite application interchangeable without rearranging the entire application. It also facilitates the reusability of components. We will be happy to advise you on how to expand your existing Notes applications with composite application elements in a meaningful manner and will design new, flexible composite application architectures and components for you. With Eclipse plug-in development, the Lotus Notes Client interface of versions R8 and higher can be expanded almost without limits. An expansion of the sidebar, the side area of Notes Client, is only one way of increasing productivity in your daily work here. Live Text describes the storing of certain strings (like flight numbers or company names) in texts, e.g. in e-mails. One click on these elements will then display flight times or address data, for instance, without lengthy searches on the Internet. The migration of existing applications (e.g. Java based desktop clients) to Lotus Notes Client will – in addition to the advantage of automatic distribution/updating – give you ideal integration of the application into your daily workflow. We will carry out these migrations for you and advise you on how to even further increase the value of your application by using composite application, for instance. One example of the migrations we have carried out is Weilgut MindPlan of our partner company Haus Weilgut. Get more out of your Lotus Notes Client. We will be happy to advise you on expanding your Lotus Notes infrastructure.